This pilot action research would not have been possible without the unstinting support of many people who, like us, felt that a big gap exists in the understanding of the geohydrology of the Himalayan midhills and its influence on the livelihoods of the millions who depend upon it. ICIMOD expressed interest in the initial ideas put forward by the Nepal Water Conservation Foundation (NWCF) and supported this research with time, resources, and encouragement. We especially thank David Molden, Director of ICIMOD, Renate Fleiner, Kanchan Shrestha, and all the team members of ICIMOD for their support. We would also like to thank Ingrid Schneider and Narendra Dangol of Namobuddha Resort, and Gopal Dahal of Lutheran World Federation and his field support team. Special thanks are due to Madhukar Upadhya, one of the founding members of NWCF, whose pioneering book on springs and ponds Pokhari ra Pahiro was the inspirational source of this study. We also drew inspiration from the insights of Jari Lukka, Team Leader, while preparing a handbook for recharge pond construction for the WASH Program of the Rural Water Supply and Sanitation Project in Western Nepal (RWSSPWN) supported by FINNIDA. The massive earthquake that struck Nepal on 25 April 2015 caused a major disaster in the villages in the areas where this research was carried out. In Dapcha alone, almost 90% of the houses were destroyed. The people in our study area have our deepest sympathy and we will support them in any way we can. We understand that rebuilding will be a long process, and having sufficient water to meet daily needs will be critical before, during, and after rehabilitation. In the second phase of this project, we have started an investigation to discover whether the springs, wells, and deep borings in the area have been disrupted, whether new sources of water have appeared, and whether any immediate action can be taken to help recharge existing low discharge and dried up springs. The local communities and leading village voices in our pilot study areas in Daraune Pokhari and Tinpiple provided tremendous help to our team in carrying out the fieldwork by providing valuable information, insights, and local knowledge, and most of all a warm welcome and hospitality to all of us. We especially wish to thank Nawaraj Adhikari, Krishna Bahadur Tamang, Dinesh Adhikari, Hari Adhikari, Keshav Humagain, and Rajina Adhikari of Dapcha, and Bhoj Raj Panta, Badri Prasad Dhungana, Narayan Sapkota, and Saroj Dhital of Tinpiple, as well as the many other members of the community who helped us at both sites. Sharma, B.; Nepal, S.; Gyawali, D.; Pokharel, G. S.; Wahid, S.; Mukherji, A.; Acharya, S.; Shrestha, A. B. 2016. 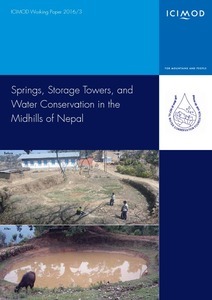 Springs, Storage Towers, and Water Conservation in the Midhills of Nepal. Kathmandu, Nepal: International Centre for Integrated Mountain Development. ICIMOD Working Paper 2016/3.